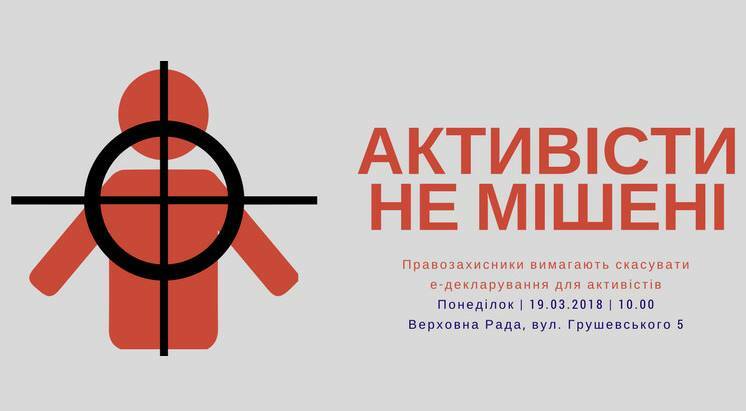 On 19 March at 10:00, near the Verkhovna Rada of Ukraine (5 Hrushevskoho St.), human rights defenders will hold a rally demanding to abolish mandatory electronic tax returns for civil society activists. During the rally, human rights defenders wearing huge targets will line up in front of the Parliament building to demonstrate that activists have become targets for the government after the introduction of e-declarations. Yuliya Kyrychenko — member of the board at the Center of Policy and Legal Reforms, member of the board at the Reanimation Package of Reforms. As a reminder, in the spring of 2017 members of the Parliament amended the Law of Ukraine “On Prevention of Corruption”, obliging not just civil servants, but also civil society activists and citizens “involved in the implementation of measures related to the prevention and combating of corruption” to submit electronic tax returns. Any person that so much as attends an anti-corruption rally could fall under that definition. Moreover, there is no clear explanation of the law, and failure to comply with it entails criminal liability. Both the general public and the international community consider these norms undemocratic and discriminatory.